Civil engineers that work in the renewable energy sector specialise in the design and construction of a variety of renewable energy technologies. 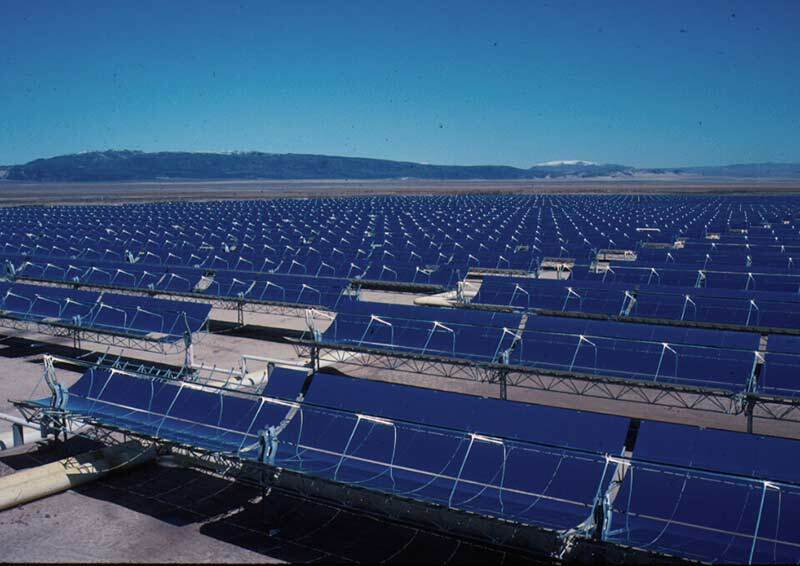 A solar energy park in California. Renewable energy resources must play an increasing role in our energy mix moving forward. Their duties include; carrying out site inspections and energy surveys; combining renewable energy production with existing power systems; preparing detailed schedules of work, feasibility studies and cost estimates and checking site and ground conditions for the installation of renewable technologies, such as wind turbines. A career as a renewables engineer can be rewarding in a number of ways. There are a wide variety of renewable energy technologies. Some are well established, others are at the cutting edge of innovation, giving the opportunity to research and develop new energy generation methods. You will be working alongside electrical and mechanical engineers, providing construction support and advice on strategy and best practice. You will also liaise with clients and operation departments to ensure safety, cost efficiency and sustainability of construction and development. You will need to keep up to date with legislation and environmental standards in order to make sure systems and processes comply. In doing so you will be helping to reduce carbon emissions, mitigating the risk of climate change and ensuring we meet the carbon reduction targets of 2050. Both the the volume and scale of renewable energy projects has increased significantly in recent years. Whilst this undoubtedly provided fantastic opportunities for those working in the renewables sector, it has provided increased technical challenges. This is perhaps most evident in the offshore wind sector with the round 3 offshore qind farm projects increasing in size significantly and moving further into deeper water. As a result, the foundation design has become increasingly complex with civil engineers now looking at XL mono-piles, jackets and gravity bas foundations. The other development that has had a major impact on the whole renewables sector relates to the shift to a competitive subsidy regime (Contracts for Difference) under the Electricity Market Reform (EMR). This has meant that civil engineers had to look for increasingly innovative solutions as a means of driving the costs down. The sector remains reliant to varying degrees on various incentive mechanisms and some notable changes in recent years have led to immediate impacts on deployment, including the shelving of many projects that were in development. Civil engineering firms bidding into the renewables sector remain very exposed to such legislative risks. Although some of the recent government policy developments risk having a detrimental impact on parts of the sector, the long term growth prospects for the renewable energy sector remain very positive. With significant volumes of existing coal and gas powered generation due to come off line over the next decade the UK energy industry needs to rise to the challenge of providing sufficient additional generation to keep the lights on whilst meeting the needs of the ‘energy trillema’: supply that is affordable, low carbon and secure. Renewable Energy generators such as wind, solar, biomass and tidal power are all well placed to play a key role as part of the future energy mix. The 2009 Renewable Energy Directive sets a target for the UK to achieve 15% of its primary energy consumption (which includes heat and transport) from renewable sources by 2020. Looking at the electricity sector alone, this would require an increase in electricity supplied by renewable energy sources to rise from current levels (about 14-15% in 2014) to over 30% by 2020. Meeting this increase in supply will require significant increases in the installed capacity of the three main renewable energy generators: onshore wind, offshore wind and solar PV, but most projections also predict greater diversity of energy sources including biomass, energy from waste and marine technologies. Alongside the more established renewable energy technologies there are exciting developments in other areas such as tidal power (notably the Swansea Bay tidal lagoon project) and energy storage both of which potentially offer exciting opportunities for civil engineers. How do I become a renewables engineer? A Bachelor's degree in Engineering is required, such as Civil Engineering or Civil Engineering Technology. Foundations in particular are a key focus area for most renewable energy projects. How do I return to civil engineering as a renewables engineer? For those who are already qualified as a civil engineer, the prospects of being able to enter the renewable energy sector are good. The rapid growth of the industry means that the major industry players have had to learn how to recruit and re-train people from other sectors. In addition to this there are organisations like the Renewables Training Network (RTN) who have been set up to specially train people for the industry. I do not have a degree in civil engineering. What next? If you do not have a civil engineering degree, or would prefer to take a vocational route into the profession, how about becoming a civil engineering technician. How can I learn more about the discipline of renewable engineering? Our energy infrastructure future: smarter living and central electricity generation? - This presentation focuses on the benefits and opportunities presented by the development of locally generated, stored and transmitted electricity, and how best to combine these developments with central large-scale electricity generation and transmission.